TORONTO, June 18, 2013 - Greater Toronto Area REALTORS(r) reported 4,620 sales through the TorontoMLS system during the first two weeks of June 2013. 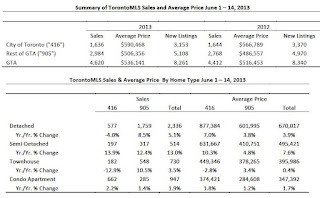 Year-over-year sales growth was driven by the regions/counties surrounding the City of Toronto. Home sales in the City were basically flat in comparison to last year. "The expectation was for an improvement in home sales in the second half of 2013. Early June results are in line with this outlook. Many households have adapted to stricter lending guidelines and have renewed their search for ownership housing," said Toronto Real Estate Board President Ann Hannah. "It is also important to note that new listings were down over the same period. With sales up and new listings down, market conditions became tighter. This supports the moderate to strong rates of price growth reported for most major home types, including condominium apartments," added Ms. Hannah. 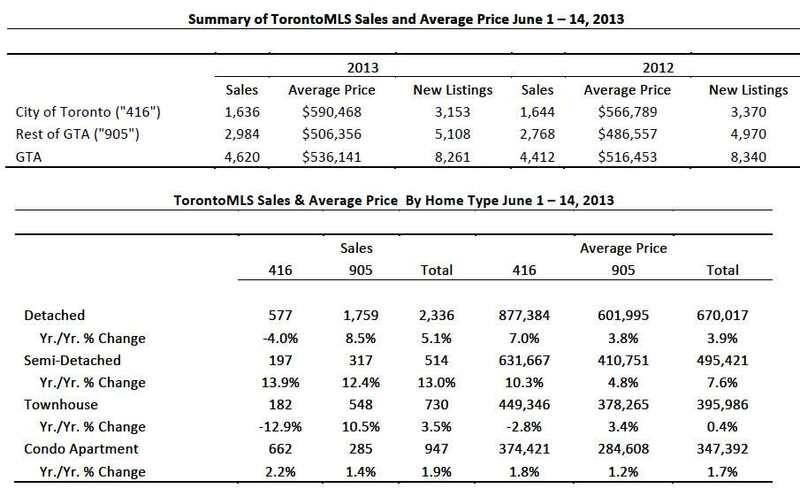 The average selling price for the first fourteen days of June was $536,141 - up by 3.8 per cent compared to June 2012. "While price growth has been driven by low-rise home types this year, condominium apartment price growth has improved since March. Despite higher inventory levels, there have been enough buyers relative to available listings to support condo price appreciation," said Jason Mercer, TREB's Senior Manager of Market Analysis.